Mark Scheifele started Winnipeg's third-period comeback and then got the deciding goal in the shootout as the Jets rallied to beat the New York Rangers 4-3 Sunday night. The Winnipeg Jets knew it was only a matter of time until their relentless offensive would eventually break through and overcome a three-goal deficit. 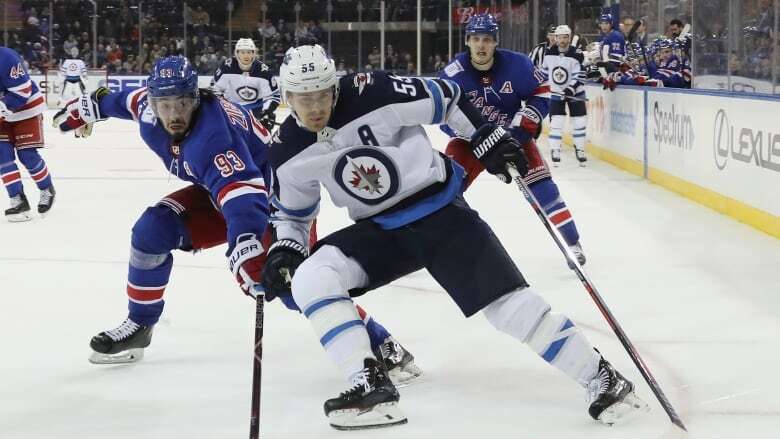 Mark Scheifele scored to start Winnipeg's third-period comeback and then got the deciding goal in the shootout as the Jets rallied to beat the New York Rangers 4-3 Sunday night. "We know we got a lot of skill," Scheifele said. "We know we can put three goals in a period." Jack Roslovic and Bryan Little also scored in the third as the Jets erased a 3-0 deficit and won their third straight. Jacob Trouba had two assists and Connor Hellebuyck stopped 16 shots. "I don't think we felt like we were out of the game," Jets captain Blake Wheeler said. "They got a pretty good guy in between the pipes. Our mindset going into the third was just try to throw everything at him [Lundqvist]. See if we can squeak one by him and get a little momentum." Marc Staal had a goal and an assist, and Chris Kreider and Jesper Fast also scored for New York. Henrik Lundqvist made 39 saves through overtime as the Rangers lost for the fourth time in five games. New York also lost in a shootout for the first time this season after starting 4-0 in tiebreakers. "They owned us, we tried to survive for two periods. They just kept coming," Lundqvist said. "When a game is played like that you know they are going to have enough looks to come back. ... But I felt like they were the better team, no question." Mika Zibanejad, who had two assists, scored in the second round of the shootout for the Rangers, and Laine then tied it. After Hellebuyck forced Jimmy Vesey wide, Scheifele — who got the game-winner in overtime at New Jersey on Saturday — beat Lundqvist for the win. "Our goalie was outstanding from the drop of the puck," Rangers coach David Quinn said. "That is one heck of a hockey team. Probably the best team we have seen all year." Winnipeg trailed 3-0 after two periods before Scheifele and Roslovic each scored in the first 4:36 of the third period to pull the Jets within one. Scheifele extended his point streak to five games and has registered five goals and four assists during that stretch. "Wheeler is probably the best passer in the league," Scheifele said after Wheeler delivered a perfectly placed backhand pass to set up Winnipeg's first goal. "He is a special player. I am pretty lucky to have him dish me the puck."